Flow North Paddling Company » Blog Archive » Worried About Bears? Many people get nervous when they realize they’ll be paddling and camping in bear country. In fact, about 75% of Alberta is Bear country, but it’s the part of the province with the least population. So many people are unfamiliar with bears and what to do to avoid a bear encounter — and what to do if you have one. The most important thing to do is KEEP YOUR WITS ABOUT YOU. Stay calm, size up the situation and try to determine if the bear is a grizzly or a black bear; back away slowly, talk softly and don’t look it in the eye; in an encounter with a non-charging bear with cubs, you should appear passive; do not raise your voice. Never run; you can’t outrun a bear and running may excite the bear and cause an attack. Don’t harass or chase the bear. If there are cubs in the area, move away from them. Make every effort to leave the bear an escape route. Climbing a tree is an option but offers no guarantee of safety. Black bears are excellent climbers, and grizzlies have also been known to climb trees. If the bear charges you, stand your ground, and speak in a calm voice. Many times, bears will do “bluff charges.” Avert your eyes. If the bear continues its charge and gets closer, you can try to intimidate it by jumping up and down, making yourself look bigger and shouting. If you have pepper spray, you can use it now. See this video from Alberta Bear Smart (Sustainable Resource Development) on how to properly use pepper spray. More on Bear Deterrents. Everyone wishing to rent a canoe or kayak — or do any other type of outdoor recreation — in Northwestern Alberta should read the booklet before their trip. You cannot tell the difference between the bears by colour; both Black bears and Grizzlies range from dark to blond colours. 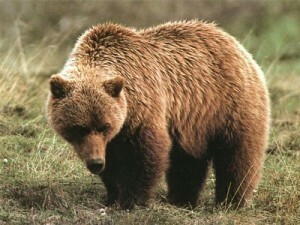 Notice how the Grizzly has smaller ears, and a “dent” where its nose meets its face. Its head above the nose (where its eyes are) is round-ish, like a basketball. It has a hump on its shoulders, and its rear end appears lower than its shoulders. The Black Bear has large ears that stick out from its head more, and a continuous slope down its face and nose. It doesn’t have a hump, and its rear end is higher than its shoulders. The first thing to do is prevent encounters in the first place. You can do this by remembering that bears have a very keen sense of smell. Always think about what smells at your campsite, on your body, or in your tent. Keep your tent a smell-free zone — cook, wash dishes, store smelly clothes and all garbage about 100 m away from your tent. Do not sleep in the clothes you cooked or ate in. Put them in an airtight container or bag, or hang them in a tree (or between trees). If you are walking on the shore looking for a spot to camp, go to the bathroom, or hang your food in a tree, be sure to make a little noise, so any bears in the bush nearby hear you and have the chance to get out of your way. If you take these steps, you greatly reduce your chance of an encounter. Bears are not interested in eating you; they prefer other foods, such as plants, roots, insects, small mammals and animal carcasses. If you see wild strawberries, raspberries, or blueberries, devil’s club or wild sarsparilla, be extra-alert as these are some favourite foods. 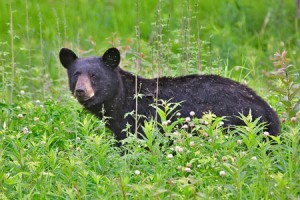 Improperly managed garbage, compost, dirty barbeques, pet food, fruit trees and berry bushes can attract bears. This leads to “problem bears” — but in reality, human behaviour is the problem. 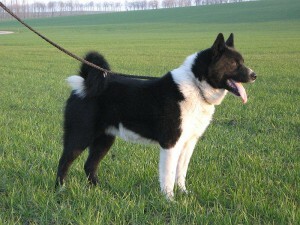 In researching this article, I came across a new strategy for “problem bears.” Rather than killing or relocating the bears, there’s a program that uses Karelian Bear Dogs to scare the bears and “teach” them not to come back. Bears are smart and this program is very successful. For more about bear behaviour, surf the Bear Smart Society’s pages, in particular, this interesting page. Comments Off on Worried About Bears?